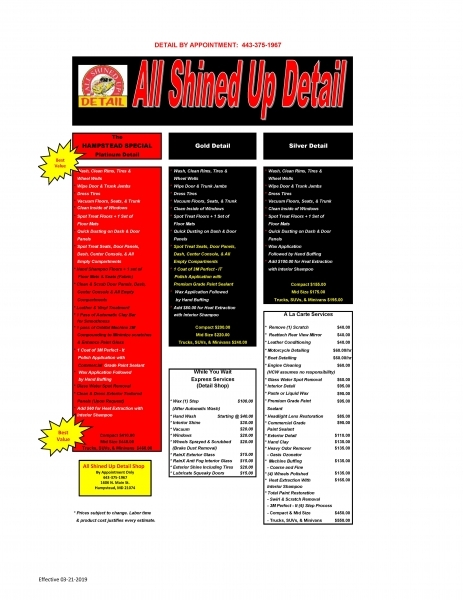 Our detail shop in Hampstead, MD provides the ultimate interior and exterior vehicle detailing services. Our professional, highly skilled staff will give every inch of your car the attention it needs. We use only the highest rated and most effective products on the market to ensure that your car remains immaculate weeks after the auto detailing is completed. All Shined Up Hampstead Detail Shop services are by appointment only. Check out our pricing and options below and give us a call to schedule!